Reviews for Owners.com, a multi-state real estate broker and an agent referral network that offers consumers listing savings and buyer’s refunds. A multi-state broker, a full-service company rebates buyer part of the commission it receives, where allowed, and provides listing savings to sellers. Offers consumers listing savings to sellers (2% listing fee) and buyers where allowed by State law (50% rebate). Owners.com also offers MLS Listing $495 where the seller is self-represented. Owners.com has a $3,500 minimum commission for all agent listing and agent buyer’s representation services. Owners.com and Altisource (NASDAQ: ASPS) as a parent, is one of the largest real estate agents and referral networks in the United States that offers service of a traditional agent with a competitive commission. 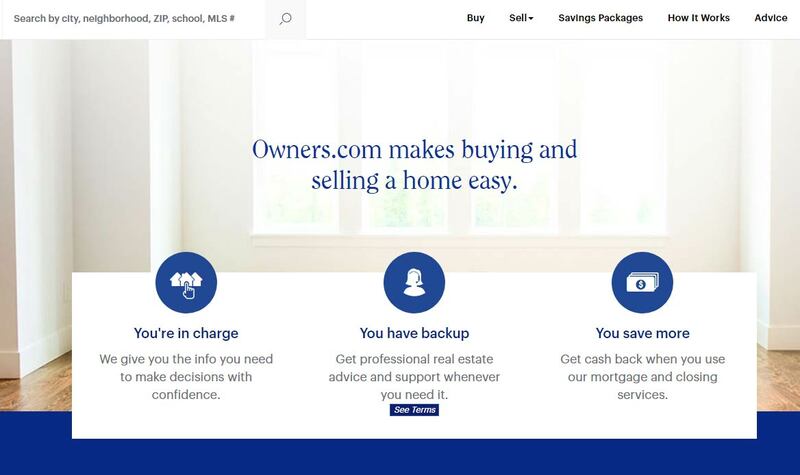 Owners.com sells over 25,000 homes a year, however, out of all transactions originated by Owners.com, an undisclosed number are referred to third-party brokers. Owners.com states that “in some areas, we undertake to arrange for you to enter into an agreement for such services with a local licensed broker or agent who may be an unrelated third party.” When consumers work with Owners.com listing agent the listing includes posting home on the MLS and MLS Aggregator services, professional photos, 3D tour and all typical services offered by a traditional real estate agent. Where Owners.com cannot directly serve consumers, the company relies on a referral network of independent agents at other brokerages. The company states that it “will inform you that we are referring you to a third party and you have the opportunity to decide whether to work with that third party.” Owners.com does not specify the referral fee percentage split these agents pay to the company in exchange for user leads, it is most likely 25%-40% of the agent’s entire commission. Once Owners.com refers a customer to a Partner Agent, that agent, not Owners.com, represents the customer from the initial meeting through closing. Owners.com dictates that Partner Agent commission rates are set at 2% for all independent real estate agents who want to participate in the Partner Program. In the United States, all independent brokerage fees are always negotiable and each real estate agent establishes its own policy for a fee structure, amount of commissions, and the sharing of any listing commissions. Price fixing is prohibited by antitrust legislation. To fix, control, recommend, suggest or maintain commission rates or fees for other agents' services is an improper practice. Delivered exceptional service, an easy to do business with.